"(Still on Tear) Sounds like "Hero Syndrome" at work." 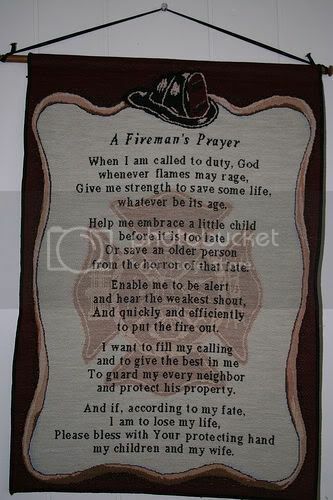 I have always been intersted in the fire service ever since i was a little kid.. my father was a firefighter and i always wanted to follow in his footsteps so when i was old enough i joined up and i have been in love with it ever since.. I love the fact that when people are in trouble I am one of the ones that are called to help and it brings joy to my heart to help the citizens of the city. In the fire service and ems agencies nobody wants to join due to the fact that if it is a volunteer department they won't get paid so they think that it is pointless to join which leads to the volunteer numbers decreasing rapidly. we are doing good down in texas! how about yall...been busy lately? its going good. they were busy running calls all day yesterday. just like all of edgecombe county. every station in edgecombe was out all at one time yesterday. every station had more than 2 calls yesterday. I know what you mean, same thing on this end of town! We were on a roll at the end of 07' with fire calls, but it go quiet after the new year. Keep in touch and keep it safe! Sure Do! How things on the South end?